On September 28th, 2013, the two hearts of Shacolann and Denroy Lett joined in marriage and today marks one year of them professing their undying love to each other. 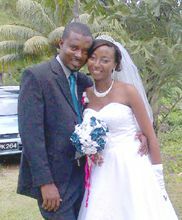 I pray Godâs continued blessings on your marriage, that it will continue to grow from strength to strength. Let the love continue to reign. Your love, Lizanna.